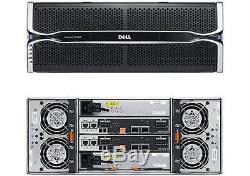 Dell PowerVault MD3860i 10GbE iSCSI SAN High Density Storage. 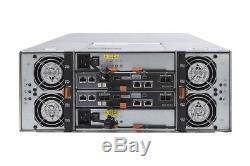 1 x Dell PowerVault MD3860i 10GbE iSCSI SAN High Density Storage Array With. 2 x 10gbe iSCSI 4gb Cache MSA Controller Modules - WX6YV. Supporting up to 64 hosts with 10Gb iSCSI connectivity, the MD3860i high-density array offers high performance and scalability, featuring. Up to 60-drive configuration (20 HDDs minimum), supporting 2.5" and 3.5" SAS, near-line SAS and SSD drives in a 4U chassis. Standard High Performance Tiering with SSD Cache and Thin Provisioning to optimize performance and capacity. Single or dual active/active controllers. 4GB cache per controller or 8GB per controller in dual-controller configurations. Dynamic Disk Pools that can support up to 1024TB of data in up to 20 disk pools with up to 120 SSD drives. Dynamic Disk Pools (DDP): Optional configuration to RAID disk management. VAAI support: Available for customers using VMware vStorage APIs for Array Integration. VCenter Plug-in: Available for customers using VMware vSphere. VASA: vStorage API for Storage Awareness, available for use in conjunction with the vCenter Plugin. SRA: Sight Recover Manager, available for use with vCenter Plugin. Self Encrypting Drives (SED): Provide an additional level of data protection. High Performance Tiering: Increases array I/O performance. SSD Cache: Accelerates application performance by utilizing SSD drives as extended controller read cache. Each controller contains 4GB of battery-backed cache. Dual controllers operate in an active-active environment mirroring each other's cache. Cache protection is provided via flash memory for permanent data protection. Dynamic Disk Pools6(DDP) eliminates the need for complex RAID management while optimizing data protection, and can be used with existing RAID configurations. 3.5--7,200 RPM NL-SAS drives available in 500GB, 1TB, 2TB, 3TB, 4TB , 6TB, 8TB. 2.5--15,000 RPM SAS drives available in 146GB, 300GB, 600GB. 2.5--10,000 RPM SAS drives available in 146GB, 300GB, 600GB, 900GB, 1.2TB, 1.8TB. 2.5--7,200 RPM Near-line SAS drives available in 500GB, 1TB, 2TB. 2.5"--SSD available in 200GB, 400GB, 800GB (WI); 400GB, 800GB, 1.6TB (MU); 800GB, 1.6TB (RI) (available with 3.5" HDD carriers). The item "Dell PowerVault MD3860i 10GbE iSCSI SAN High Density Storage Array 2x Controller" is in sale since Friday, August 17, 2018. This item is in the category "Computers/Tablets & Networking\Enterprise Networking, Servers\Network Storage Disk Arrays\SAN Disk Arrays". The seller is "itinstock" and is located in London.